Jeff called me up the other day and told me that Mark was going to be in town this weekend for another ride. I had not ridden in months. One thing after another kept popping up, or the weather was real bad. So I was happy to get out on a good ride. mark is always fun to ride with, and Jeff had just purchased a 2003 Honda 350 Rancher, so we were all excited to get in a good ride. I really wasn’t sure that the weather was going to do, but it was about 59F when I headed to Jeffs. Yea, I know, late start, what can I say, sleeping in feels soooo good. It was an overcast day, but seemed fine for the first few hours. The day eventually got a bit worse, with scattered light rain throughout the afternoon. It was one of the muddiest days I have ever road. By the end of the day I was pretty well soaked, and fairly covered in mud, but I didn’t care, it was all worth it. I was a bit concerned at first how the day was going to end. I got to Jeff’s, only to find him and Mark both had flat tires already. We got them plugged quickly though and had no problems the rest of the day. 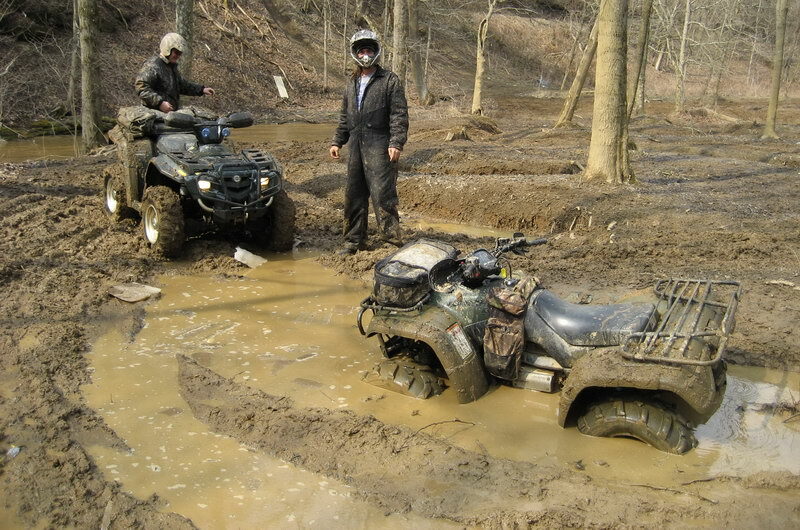 Well, one slight problem, seems Jeff just had to see what his new Honda could do in the mud. Yep, he was stuck pretty good. Luckily Mark and I both have winches. Marks wasn’t working at the time though, seemed it wasn’t getting power. Hope he can get that fixed easily. I managed to pull Jeff out, but just barely. My stock tires are very worn, and spent the entire day sliding around like crazy. Even in 4WD I could barely steer. So I spent the day drifting around turns, which was alot of fun though. We spent a good bit of time at a place we call the sulfur pond. Which is basically what it is, a shallow pond with a very high sulfur content. Really red water and mud. I am sure its not the best place to be playing around, but it sure was fun. We ended up doing laps around the pond pretty much full throttle. I was holding about 30 mph drifting around one side, it was a blast! Even though it wasn’t the greatest weather, it was well worth getting out on a long overdue ride. Always good to hookup with Mark also. mark was taking Jeff’s old Scrambler back to Ohio with him, not sure why. I think he might be taking it out to shoot it, and put it out of its misery?